Hello, so you are new to digital photography. This page and the many links presented here will help you get underway. Material here is organized in an orderly fashion so new users of cameras and computers can gain the knowledge and skills to confidently step into the age of digital photography. There are a great number of cameras available. They differ in many big and small way, so we cannot tailor this site so it will apply just to your camera. In fact, here we do not cover the techniques and skills for taking pictures – what you do with the camera. This site picks up where the camera process leaves off. Cambridge in Colour – yes, that is Cambridge in the United Kingdom – hence the spelling. You will find their tutorials excellent and very helpful. Another good source of helpful information for starting photographers is the “For Beginners” section of Digital Camera World. They also have a Tutorials page but that contains material of a wider range of topics. These steps will be taken up in turn. Mostly with links to tutorial posts. There are many applications for organizing and editing photos on a computer. Some very sophisticated, some quite simple. On this site we will concentrate on Windows Live Photo Gallery. Windows Live Photo Gallery is a free download, it is part of Windows Live Essentials. Click on the image above to go to the Windows Live Essentials site. You can download the apps from there. 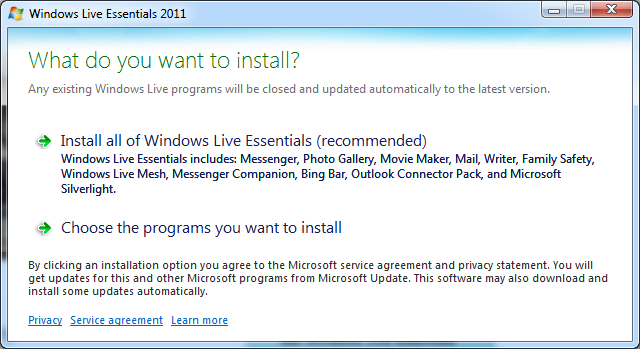 You will encounter an opportunity to select all of the Windows Live Essentials componets, or just specific ones. Select “Choose the programs you want to install”. Windows Live Photo Gallery and Windows Live Movie Maker work hand-in-hand and install together. Choose other applications if you like, but these two, Gallery and Movie Maker, are all that you need to manage your photos. There make some support items that need to be installed – but your computer will let you know. There is another item you may need, a “codec”, but that too, will be flagged later when you need it. When you have Photo Gallery installed you are all set for the next step: to bring photos in from your camera. Windows Live Photo Gallery offers the tools for managing your photos as well as editing and sharing them. If you do not yet have a SkyDrive sign up for one. You can follow the instructions in this article: Setting up your SkyDrive. This page is in preparation – please excuse our dust.